$50 OFF WHEN YOU SPEND$495 OR MORE ON FASHION JEWELRY - Use coupon code "50off"
Stunning shared-prong wedding rings allow the individual diamonds to glisten, adding shine and sparkle to any engagement ring set. Stunning shared-prong diamond wedding bands are an efficient, dynamic setting to strut large and prominent alluring diamonds. Impressively sized diamonds reflecting a richness of light in an adequate, well-tendered environment allow them the space to shine in all their glamorous glory; a minimum amount of metal and a maximum amount of never-ending reflecting light. Diamonds require a bountiful amount of sunlight, with the least amount of metal in between vibrant diamonds with a delicate, yet secure shared-prong. These matrimonial diamonds will shine more wondrous, capturing the eyes of all. Diamond eternity bands that feature a shared-prong setting are the most suitable and resourceful manner in which to showcase your broad, ample sized diamonds. Larger sized gemstones are best suited on shared-prong eternity bands in comparison to smaller gemstones which are more adequately showcased on a micro-pavé setting. Prongs are wrapped around the diamond to secure and fasten it to the sleek foundation of the ring. In this instance, the precious metal of the shared-prong is also a matter of concern: Platinum vs. white gold rings. 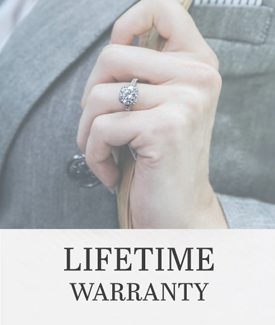 Platinum is a more durable band for shared-prongs and is less likely to break or tarnish, perfect for eternity. Diamonds reflect the light of the precious metal for a seamless, vibrant hue, these lighter bands are preferred. White gold bands eventually evolve into a yellow-ish hue can be a major issue so it could take a bit more after-care. Impeccable platinum wedding bands are the unquestionably trusted option here at Icing On The Ring. Due to the sufficient size of diamonds on prong wedding rings, these types of bands are a favored anniversary ring. Prong diamond bands appear modern, unique, and especially chiseled in their select setting; a wonderful display of endless everlasting affection. Whether it be a 5 year or 30 year anniversary, shared-prong diamond rings make for an exquisite gift for your loyal and loving significant other. A fun twist on a classic wedding band, this 14k white gold band sparkles with petite square diamonds - perfect for someone who dares to be different.